The 2019 F-150 delivers on its Built Ford Tough promise with a high-strength steel fully boxed ladder frame and high-strength, military-grade, aluminum alloy body that saves weight and adds capability. 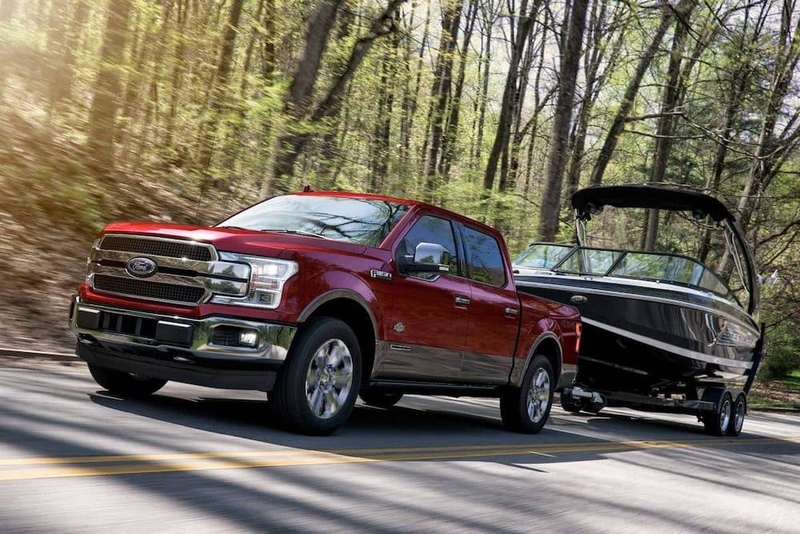 Together with powerful engines, the 2019 F-150 tows heavier trailers than ever and deliver best-in-class payload ratings. Trailer Sway Control works in conjunction with the AdvanceTrac with RSC (Roll Stability Control) system to expand the vehicles dynamic stability control capabilities, adding an additional layer of confidence and control while towing a trailer. BLIS (Blind Spot Information System) with cross traffic alert and trailer tow monitoring alerts the driver if something is detected in the trailer’s blind spot. Dynamic Hitch Assist enhancement to the optional rear camera enables easier hitching by helping to line up the truck and trailer without requiring a spotter or having to get out of the vehicle. Hill Start Assist helps prevent rolling back on a grade by momentarily maintaining brake pressure until the engine delivers enough torque to move the truck up the hill. Pro Trailer Backup Assist is an available feature improves driver confidence by letting the driver steer the trailer instinctively as they control the accelerator and brakes, while the truck takes care of the rest. 360-degree Camera System provides a view of all four sides of the vehicle. Tow/Haul Mode reduces gear hunting, improves power delivery. Especially useful with hauling or towing a heavy load. Trailer Brake Controller uses braking input, vehicle speed and ABS logic to balance the performance of the truck brakes and electric trailer brakes and is integrated into the instrument panel and vehicle ’s onboard computer. choose one of the three efficient and powerful EcoBoost engines, including the 2.7L EcoBoost V6 (325-hp; 400 lb-ft of torque), 3.5L EcoBoost (375-hp; 470 lb-ft of torque), and High Output 3.5L EcoBoost V6 (450-hp; 510 lb-ft of torque, only available in the Raptor and Limited). The 5.0L Ti-VCT V8 delivers 395 horsepower and 470 lb-ft of torque, while the 3.0L Power Stroke V6 Turbo Diesel produces 375 horsepower and 470 lb-ft of torque. As you can see, the Ford F-150 offers a number of engine configurations, each with outstanding towing and load capacity for its displacement. 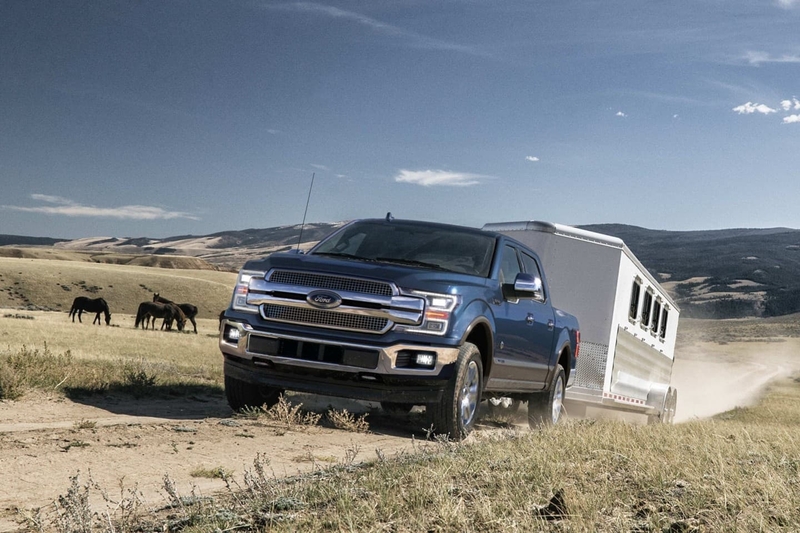 To learn about the Ford Tough 2019 F-150, stop into your local Southern California Ford Dealers, talk to their truck experts, and take a test drive. We know you’ll be impressed.